Tuna is not all the same. Tuna among other fish contains mercury the key to buying tuna is buying light tuna with less mercury. 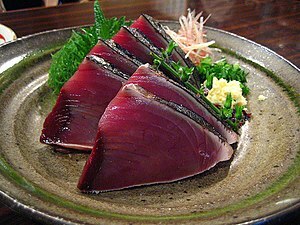 In the case of let’s say canned Skipjack vs canned Albacore, skipjack tuna has more flavor,less sodium, generally zero fat, and less mercury than albacore a white tuna with more calories. When visiting your local store select wild tuna that is light, in water (some canned tuna contains very little water so the can may not say water just tuna), with no salt/sodium added. Turn plain old tuna into a complete meal. Add Skipjack (Protein) to salad greens perhaps baby spinach (Carb / Veggie), dill weed, lemon pepper, tomatoes, fat free cheese, and dressing made of olive oil (healthy fat), and red wine or balsamic vinegar.